I’ve been trying out a new online meeting tool called MeetingKing for the past few weeks, and I’m pretty impressed with its capabilities so far. Currently, the application is still in beta, and anyone can set up an account for free. So, it’s well worth trying out just to see what all it can do. Before we actually get into how well it works, it’s probably a good idea to make clear just exactly what MeetingKing does. When I first heard about the application, I thought it was going to be some type of desktop sharing or teleconference service, but that’s not the case at all. 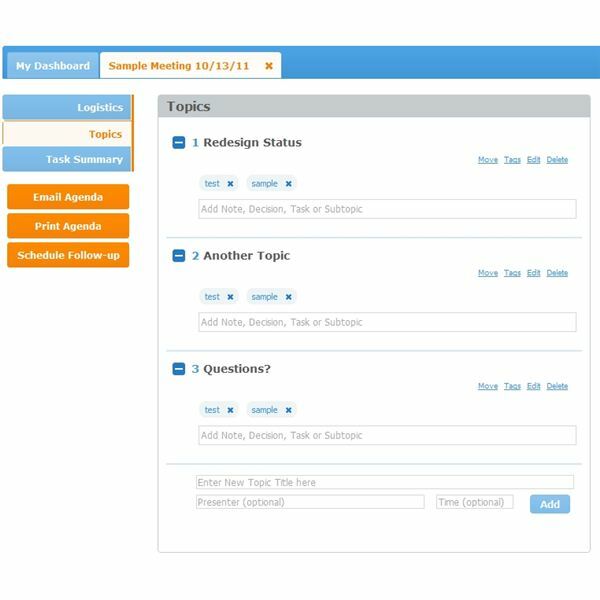 Instead, MeetingKing is an online tool that helps you plan meetings and keep track of everything discussed during them whether the meeting is large and formal or simply a two-person telephone call. 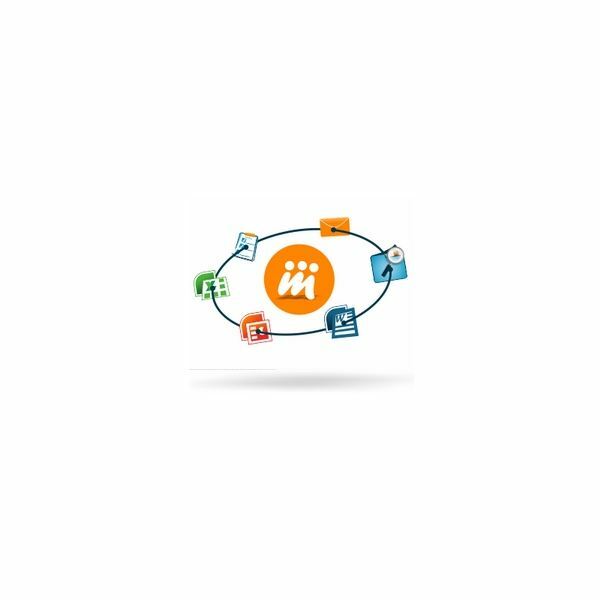 You can even use the software as a task management system since it has built-in capabilities for assigning, monitoring and following up on tasks and activities discussed in meetings. 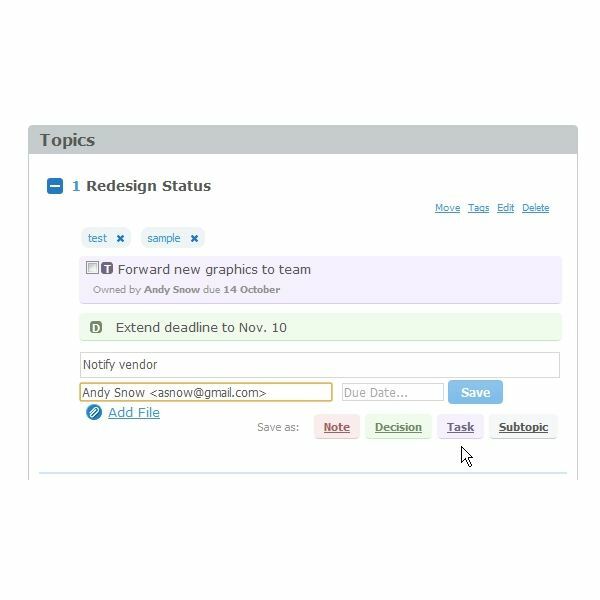 There's also an option to create standalone tasks even if they're not associated with any particular meeting or discussion. One of my favorite things about MeetingKing is that it works equally as well for formalized, planned meetings as it does for impromptu phone calls and those “Hey, you got a minute?" discussions. I’ve actually been using it mostly for the latter to help me keep better track of all those little things that pop up during the day. To schedule a meeting, all you have to do is click on the New Meeting button in your dashboard. From there, you’ll be taken to the Logistics screen where you give the meeting a name, enter the email addresses of people you want to invite, and select a time for the meeting. Instead of choosing a future time, you can click the Meet Now button to start an instant meeting. If you simply want to use MeetingKing to take notes while on a phone call, you don’t have to enter any participant names – just give the meeting a name and click Meet Now. For meetings scheduled at a later date, you can even create an agenda in MeetingKing before sending out the invitations. This is done on the Topics tab – the same place where you take notes and assign tasks. After creating the agenda, you can send a copy out to all meeting participants simply by clicking one button. You also have the option of printing the agenda just in case you want to use it to take handwritten notes. Now, this is the really cool part. Once the meeting starts – whether it’s an instant meeting or a pre-scheduled one – you can take all sorts of notes on this topic tab. If you prepared an agenda in advance, all you have to do is enter your notes under the corresponding topic. For instant meetings, you can create topics on the fly and then start typing notes. Once you enter these notes, you can designate them as just plain old notes or as tasks, decisions or subtopics. When creating a task item, you can also enter a due date and the name of the person assigned to the task. At the end of the meeting (or after all notes are entered), you can go to the Task Summary tab for a quick view of all tasks created for that meeting, who they were assigned to, and when they are due. Even nicer, you can go to the MeetingKing dashboard for a quick snapshot of all upcoming tasks along with their statuses. 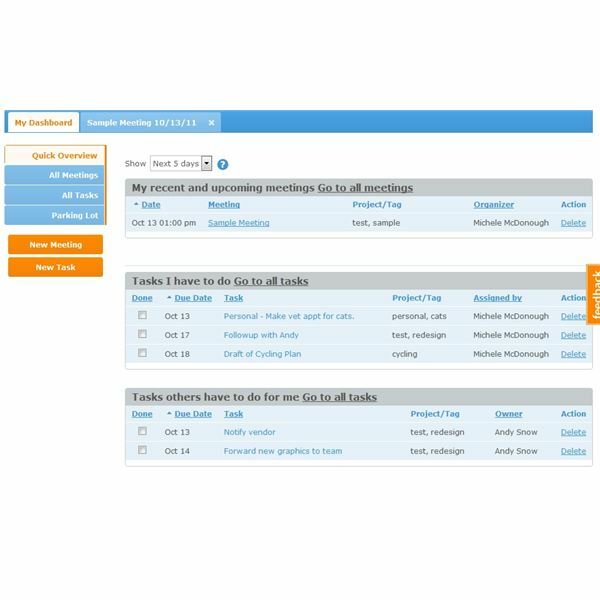 You can even enter standalone tasks not associated with any particular meeting. MeetingKing allows you to assign tags to meetings, agenda topics, and standalone tasks and lets you search on these tags. I really love this feature, especially when trying to pull together reports, since it makes it super easy to find all related meetings and other activities. Because you can assign multiple tags to each item, you can really use this feature to organize your notes in tons of different ways. For instance, in addition to using descriptive tags that cover the topics of the meeting, you can create ones like "phone" to indicate it was a phone call, "initial" for a project kick-off meeting, or "potential" to indicate that a prospective client seems interested in your services. I should note that other participants don't need to have a MeetingKing account. So, you don't have to force the application on others simply because you find it a helpful tool. Of course, if others do have an account, there are additional collaboration features, but they're not necessary for a smooth implementation of the software on your end. Since MeetingKing is still in beta, all user accounts are completely free – and it only takes a couple of minutes to sign up. Basically, all you have to do is enter your name and email address, and then wait for the email verification. There are no firm details on what future subscription prices will be once the beta period is over, but the site does note that there may be a fee for users who want to “organize meetings with more than 2 participants." However, it’s also noted that anyone who registers during the beta period will receive a free 6-month subscription once paid subscriptions are introduced. Not only is that a pretty nice deal, but you have to appreciate the candor here since many beta apps hook you in with a free subscription and never mention that you might have to pay for the same features in the future. As I mentioned earlier, I mostly use MeetingKing for instant meetings, but I've also been trying to migrate scheduled meetings to this utility as well. In the past, I needed several different apps to take care of all the jobs that Meeting King does – Thunderbird for sending out meeting invitations, Google Calendar for scheduling, Microsoft OneNote for taking notes, Word for creating meeting agendas and Excel for keeping track of tasks. It's really nice to be able to handle all these activities in one place, especially with the added organization and tagging tools. And to be honest, I don't know of any other application – online or desktop – that allows you to do all these things under the same roof. Have you tried MeetingKing or found some other tool that helps you manage meetings and tasks more effectively? If so, leave a note in the Comments – I'd love to hear what you think. Screenshots of MeetingKing taken by author.